Team Lea's Nino Alejandro vs. Karl Tanhueco sings “We Built This City”on December 13, 2014 as the Battle Round continues in The Voice of the Philippines Season 2. There is no secret that Nino Alejandro, 37, came from the musically inclined Alejandro family. His has got the same talent in his genes and his performance of ‘High Way to Hell’ during the Blinds Audition made all four coaches to turn at him. Alejandro aims to be back in the music industry with the the help of The Voice. Karl Tanhueco had chosen John Legend’s popular song ‘All of Me’ to survive the Blind Audition. Lea alone pushed the red button to turn for him. Lea was evidently delighted to have the assistant artist in her team. Like any other contenders, Tanhueco is determined to win for his family’s future. The Battles Round Result: During the coaching session Tanhueco said that he is nervous and excited to do battles with Alejandro. Tanhueco admitted that the song they were about the sing is not in his genre. Lea told them that their attitudes must be brought in the song. Team Lea's Nino Alejandro and Karl Tanhueco sang“We Built This City”. The energy filled the stage immediately which made Lea cheer. Sarah said that Tanhueco’s voice was amasing while Alejandro owned the song since the beginning. She rooted for Alejandro which was seconded by Apl De Ap and Bamboo. 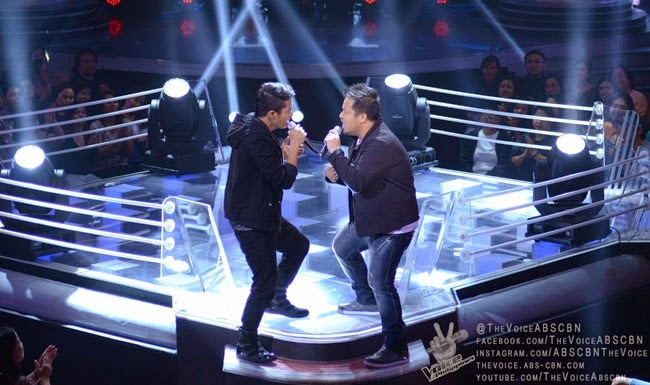 Lea admitted that the song was more of a challenge for Tanhueco but had chosen Alejandro. She said that in the music industry many will come his way that will be a challenge to him.